Book, toy, craft, and stationery shop on North End. At one point it was a Christian bookshop called Wesley Owen; see Christian Bookshops blog post. Later it was a hire purchase shop called Bright House photo, but this moved just down the road to numbers 138-140 around June or July 2017 photo of vacant premises. It was still vacant as of October 2017, but that month or the next a gift, furniture, toy, homewares, and mobile phone accessories shop called Billboard opened photo. 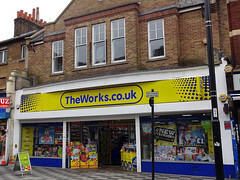 By June 2018 this had been replaced by a branch of The Works discount book/toy/craft chain. Last edited 2019-04-14 15:13:13 (version 31; diff). List all versions. Page last edited 2019-04-14 15:13:13 (version 31).